Rosalie Gokee was born on the Lac Courte Oreilles reservation near Hayward, Wisconsin. From a young age, Gokee’s parents dealt with substance abuse. When Gokee was 10 years old, her parents were found unable to care for her and she entered the foster care system. She would leave her life on the reservation and move some 150 miles away to live with her extended family, who took her in. After graduating high school in the Twin Cities, Gokee moved back to Wisconsin and raised a family of her own. In 2006, at the age of 47, Gokee moved back to the Lac Courte Oreilles reservation. It was then that she realized she felt disconnected from tribal life, and wondered if other young people felt the same. "I really had this sense that they really wanted to belong to something," Gokee said. "We just want to try and instill a sense of 'you do belong here and you do belong to this tribe.'" Though she grew up off the reservation, Gokee’s extended family was a part of Lac Courte Oreilles tribe, and provided her a sense of connection to her culture. But it wasn’t until she grew older that she realized how important it was for her to feel a stronger sense of identity with the tribe. "I wanted to know where I am from, wanting to know the sense of pride of being a tribal member here, and what I can do to give back," she said. In 2015, Gokee became a council member on the Governing Board of the Lac Courte Oreilles Band of Lake Superior Chippewa Indians. "I wanted to know where I am from, wanting to know the sense of pride of being a tribal member here, and what I can do to give back," Rosalie Gokee said. Today, 59-year-old Gokee still sits on the board and works closely with the Indian Child Welfare and Family Services Department. Based on her own experiences, and the ones of children she works with through the department, Gokee said she believes if tribal children know and appreciate their language, it will serve as a gateway to learning more about their tribe’s culture. The Lac Courte Oreilles Band of Lake Superior Chippewa Indians speak Ojibwemowin. And to encourage youth to learn the language, the Hayward Community School District chartered Waadookodaading — an Ojibwe language immersion school — in 2001. At the school, students from preschool to seventh grade learn state-required curriculum while being immersed in their native language and culture. "Language and culture is our sovereignty and we need to hold on to that," Gokee said. Schlender is a tribal member and sits on multiple governing boards within the tribal government and the tribe’s school system. He said language-learning is the strongest weapon when it comes to healing both historical and present traumas. "Having that strong tie to culture and language strengthens your identity, and in that way, it’s a preventative thing," Schlender said. "I have personally benefited from that and have seen many others, as well." While Waadookodaading is one step toward teaching the Lac Courte Oreilles’ youth about their culture, both Schlender and Gokee say more can be done outside of the reservation to solve this identity crisis. Gokee said elected officials need to provide more of an open ear to listen to tribal needs, learn about who they are and appropriately represent them in legislation and decision-making. "To just stop in and check in and see what our concerns are, we really appreciate it when those individuals take time out of their day — whether Republican or Democrat — to see what our needs are. That’s the true form of leadership in my eyes," Gokee said. Gokee added that it creates a challenge for tribal members when their needs are ignored and their voice restricted. That being said, she wants to ensure every resident’s concerns are addressed. "I think there needs to be more of a focus on what are the true needs of the state of Wisconsin, but also include the tribal needs as well," she said. Schlender agrees, but is more concerned with how the federal government handles the treaties they have with tribal nations. 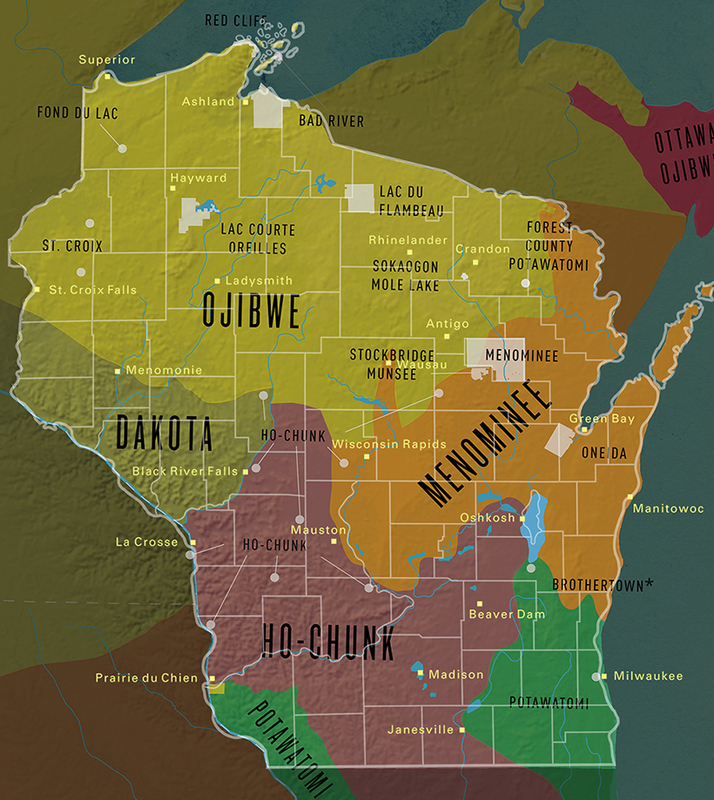 Tribal treaty lands in Wisconsin. Map created by Wisconsin Public Television Education. Wisconsin First Nations (www.wisconsinfirstnations.org/map). According to Schlender and the Lac Courte Oreilles Band of Lake Superior Chippewa Indians website, when treaties were drafted in the mid-18th century, tribes ceded land to the federal government in exchange for their right to hunt, fish and gather on that land. But, Schlender argued that the United States government has always benefited from the treaties more than the tribes, utilizing the natural resources found on tribal land — like timber and fish — to further the country’s economy, with little compensation going to the tribes. "In the meantime, we have benefited too, but it’s not equal," he explained. "Now we still want to continue to educate people that there still needs to be more in our favor so that we can have an equal part in the contract as well." Schlender said the Lac Courte Oreilles should receive equal compensation for resources to make up for what he called “centuries of abuse on tribal members and the culture as a whole,” citing government attempts to relocate or terminate tribes after the treaties were ratified. "Their identity they had was shamed," Schlender said. "Some of these things that had an impact on tribal people still remain." "Historical traumas have really impacted our communities," Gokee said. "The needs to heal, the need to educate, the need to enhance our culture, preserve our culture, our language and traditions is very important here at Lac Courte Oreilles." Joyce Miller is an elder on the Lac Courte Oreilles reservation. She said youth gaining a sense of identity will help heal the trauma of the past, but the ultimate power is knowledge. "The more you know about us, the better we are going to be," Miller said. While Schlender, Gokee and Miller have all experienced personal and cultural hardships, they stand connected in the belief that culture is the most powerful was to move forward. Editor's note: This story was temporarily unpublished Thursday, Aug. 23, 2018 to address factual errors about Rosalie Gokee's childhood. It has since been edited and was republished Friday, Aug. 24, 2018 with accurate information. WPR regrets the errors.